14 by 28-inch size pillow forms purchased online from Joanna fabrics. 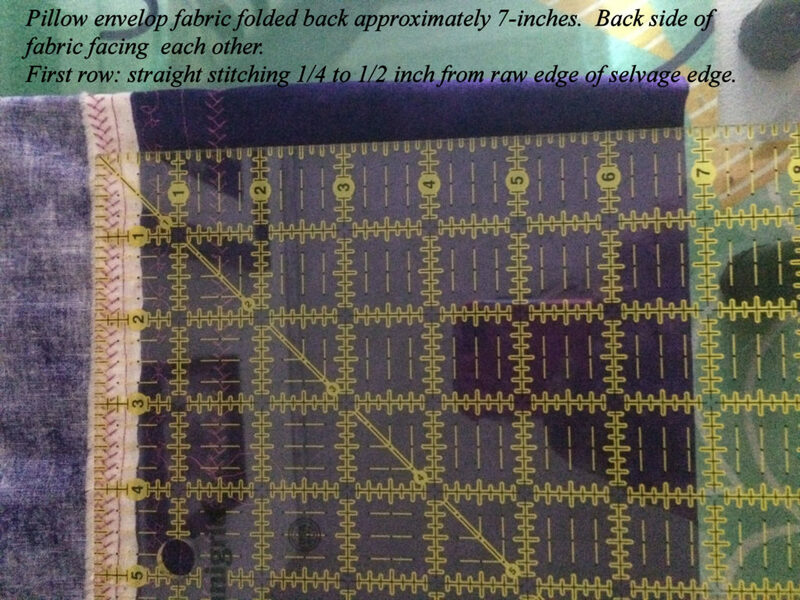 100% cotton fabric: Maywood Shadow Play (purple). Pillow cuff: decorative stitch functionality of my sewing machine (Singer 7469q). 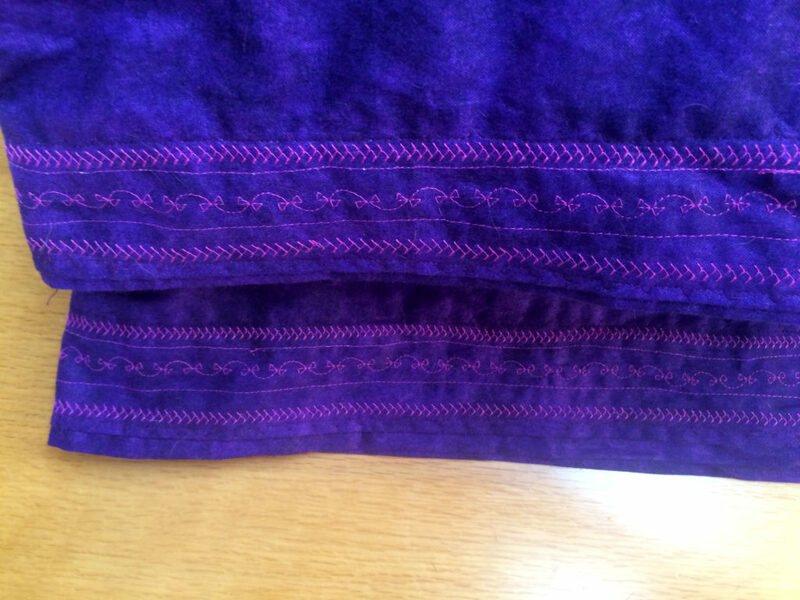 Purple pillows, decorative stitching, machine sewn. Photo taken after I used these pillows over several nights of sleep so the cotton fabric is rather rumpled looking. Pillow form: 14 by 28-inches, purchased from Joann Fabric (on sale with free shipping). $12.49 each. Thread: 100% cotton, two shades. 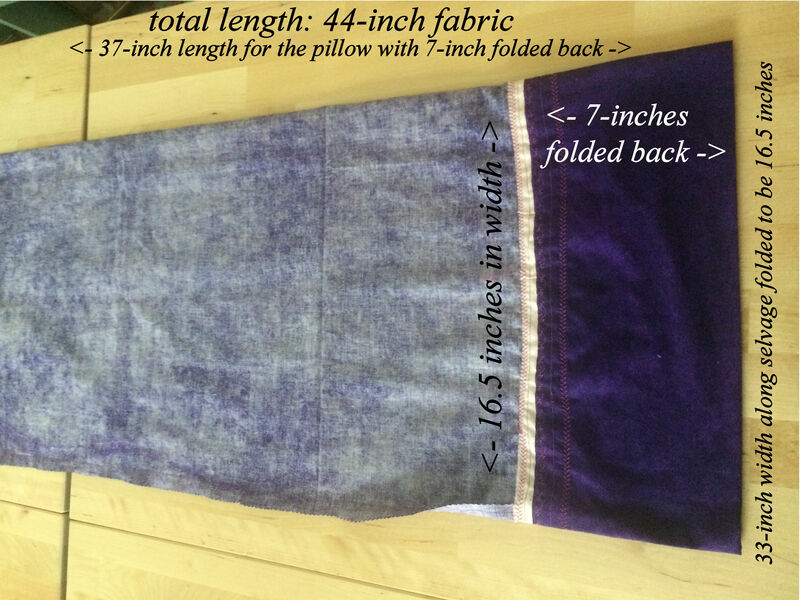 Not counting my time (90 minutes per pillow) to measure, cut and sew fabric, stitching thread ($8.00 for a spool of 1425 yards), the pillow form and fabric cost about $21 per pillow. Purple pillows sewing threads. 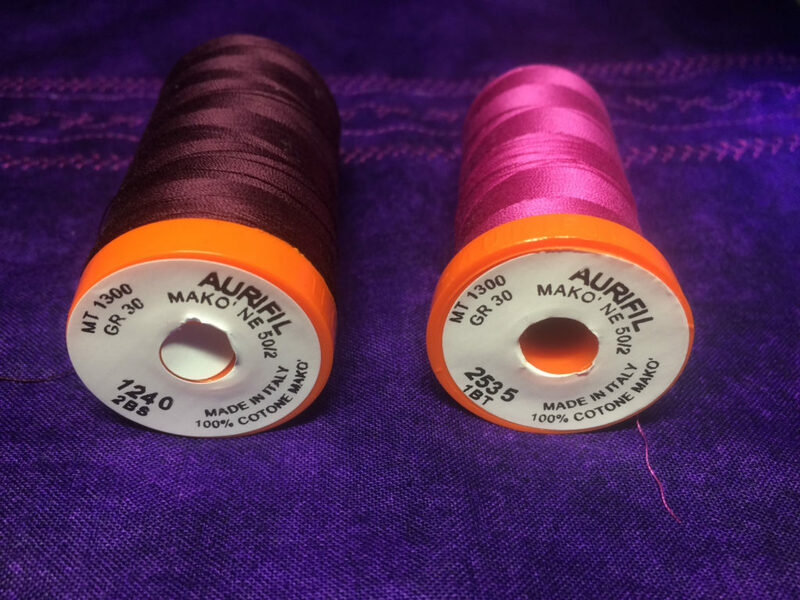 Left spool (dark eggplant) is brand new, right (fuchsia color) spool of thread is after decorative stitching of these two pillows. Notice (by comparing the two spools) how much of the fuchsia thread was used up with the decorative stitching of the two pillowcases. Folded back area of the cuff covers up the back side of the decorative stitching. Sewing Machine: Singer Confidence Quilter 7469Q, new machine purchased 08/21/2011 for $255. 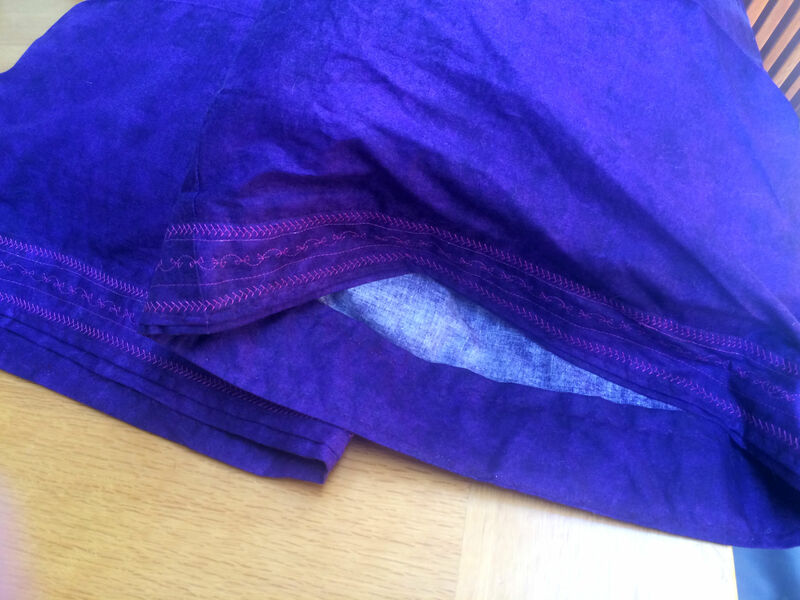 This machine has served me well for start-to-finish of five 60-inch quilts, regular straight stitch (clothing, pillows) and decorative sewing like I did along the cuff of these two purple pillowcases. 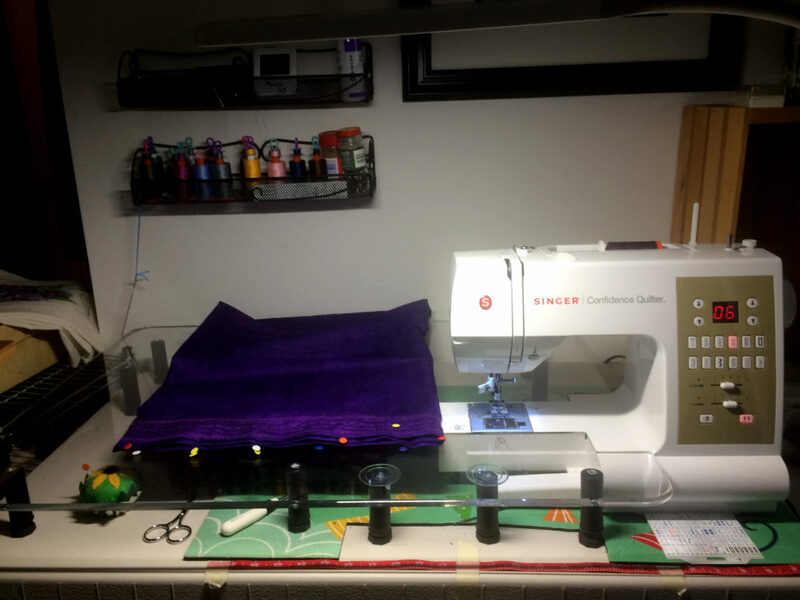 Since I began quilting (July 2018) I have purchased, for this machine, the (24 by 32-inch) Sewing Steady customized clear acrylic work top with leveling legs and a Singer walking pressure foot. Plus the metal wall racks for holding my quilting threads and bobbins and two beech wood Ikea gateleg tables that when pushed together provide me a 60-inch square fabric/cutting design area. The “emptied” plastic spice bottles that you can see on the right side of my lower wall rack are used for broken pins and broken embroidery needles. Green pad under the sewing machine and acrylic work area is an outside front door pad, used to keep the sewing machine from walking across the card-table top when I hit high speeds when quilting.